From the celebrations of India to the surf of California, Kajal Zaveri’s conception of a hometown has undertaken a range of shifts and surprises over the years. 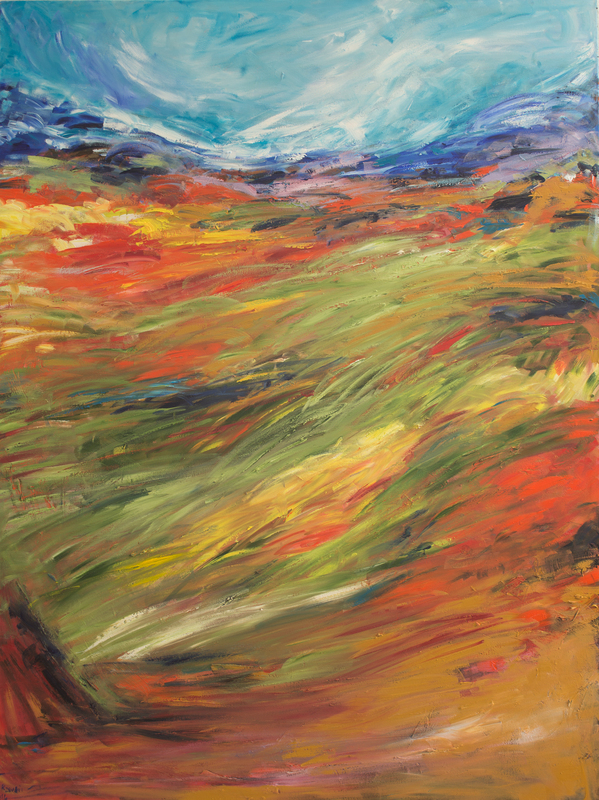 Inspired by the Californian coast, but certainly not forgetting the rich colors, sounds and spirit of her original home, she creates beautiful abstract landscapes that reflect her passion and respect for nature. Hello, Kajal! How does your original hometown inform your art? I’m an emerging artist based in the San Francisco Bay Area, California. However, I am originally from India, the land of bright colors, energetic vibes, sights, sounds, multiculturalism and strong traditions. I was always surrounded by wonderful folk and traditional art, vibrant colors and so many festivals that incorporated art and colors. For example, every year we would celebrate Diwali – the Festival of Lights, and part of the tradition was to make different patterns on the floor, as part of the art form Rangoli. My earliest memory of art is of helping my mother make a Rangoli design at home, using colored rice and dry flour. Similarly, every year in Spring, we would celebrate Holi – ‘The Festival of Colors’. We would celebrate the festival by smearing each other with colored powder and dye, all in good humor. The strong color palettes, patterns and art that I grew up with have certainly had a strong influence on my work. Kajal Zaveri, ‘Colors of Summer,’ 2016. Oil on canvas. I was lucky to grow up in a very loving family and my parents encouraged all of my artistic pursuits. When I was about nine, I enrolled in a local art class and under the guidance of an excellent and experienced teacher, I began to discover and enjoy it more. I worked hard at school and pursued a Masters in economics, but continued painting as a hobby, honing my skills by practising whenever I could. I never went to formal art school, but the local art class was enough to ignite my love for painting. What led you away from India? Was there a specific turning point in your life? After graduation, I married and moved to the USA with my husband for his job and my MBA. With my new degree, I started working in the financial sector and even though I was good at my work, I soon realized that I was not really enjoying looking at numbers and spreadsheets. I was, however, mesmerized by the diversity and beauty of California which I had started to discover through my travels within the state. 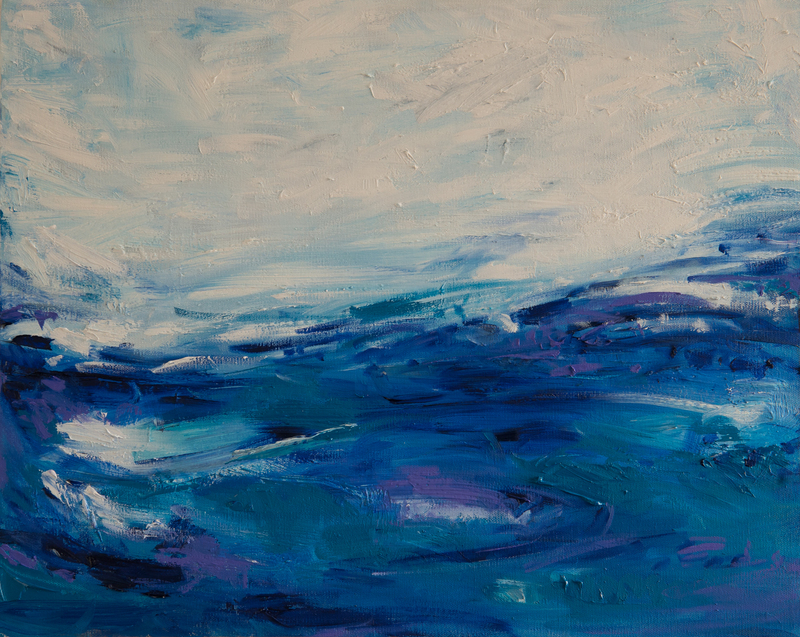 I felt a deep connection to my real self and started painting again, with a great sense of joy. 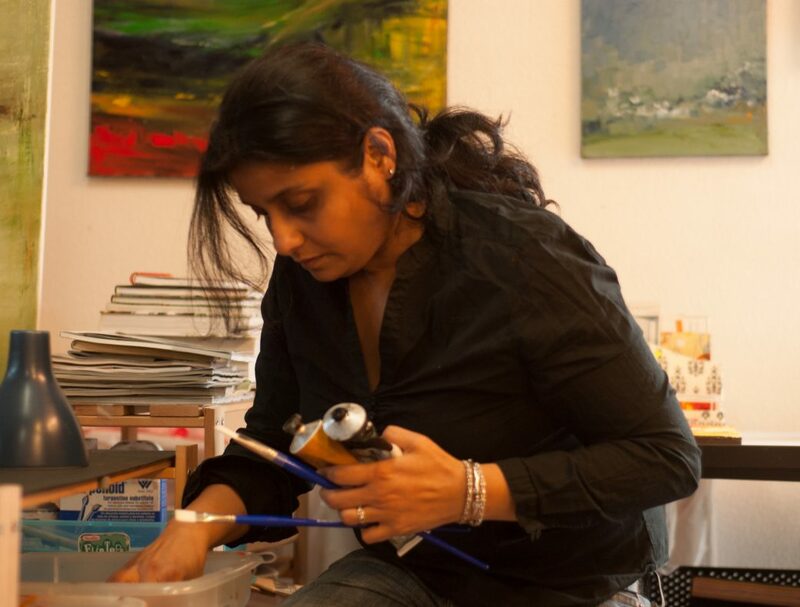 After my son was born, I quit my day job and focused my energies on my first love – painting and pursuing art as a full-time career. 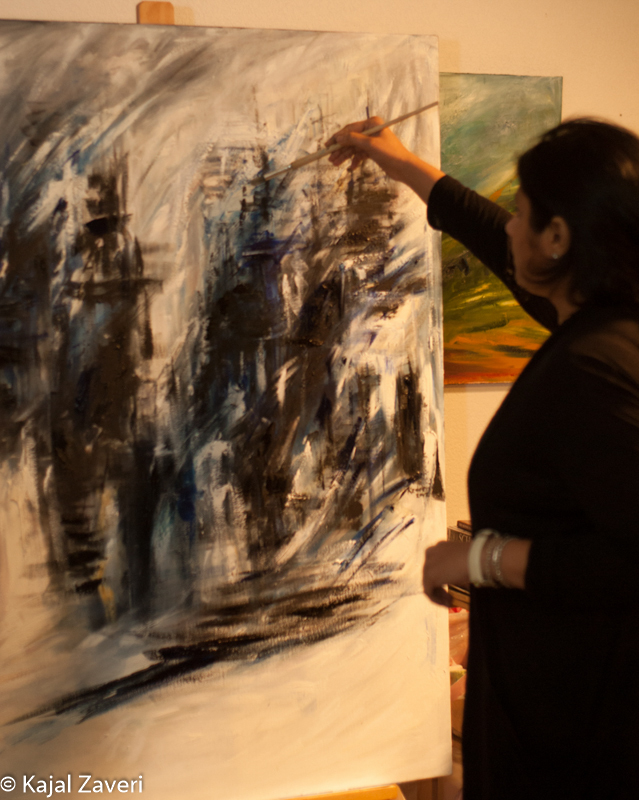 Kajal Zaveri working on one of her paintings. What’s your favorite thing about India, or Indian art? The diversity of art that matches the cultural and ideological diversity of the country is truly amazing. The vibrancy and saturation of colors, the types of art like folk, traditional and modern art, the traditions and customs that encompass colors, patterns and celebrations, all appeal to my sensibilities and inspire and flavor my work in terms of styling, strokes and color palette. I have been fortunate enough to travel to some beautiful places in the world. It would be hard to pick anything specific, but my ocean paintings are inspired by time spent in New Zealand, Australia and California. The magnificence and vastness of the Pacific Ocean, miles and miles of sand, and the lull of the waves – sometimes gentle and sometimes energetic, is always inspirational. The lush green English countryside, or the fall colors on the East Coast, the towering Swiss Alps, the sunrise in Death Valley and many such encounters have left lasting impressions. Since the viewer isn’t aware of my point of inspiration, it’s my hope that when they see my work, it ignites their own fond memories of special places and times. I hope to encourage nostalgia, dreaminess and a sense of shared experience. Kajal Zaveri, ‘Sound of the Sea,’ 2018. Oil on canvas. For many years now, I have been blessed to call beautiful California home. How has living in California changed your artistic expression, if at all? The subject matter of my work continues to be largely inspired by nature, but I feel more of a balance and symmetry in my most recent compositions. Being in California for so long, I feel like I’ve been able to find a sense of serenity and anchoring, which I find is increasingly reflected in my work. Any must-visit art addresses you can recommend in California? There is so much to see and do in California. But if I had to choose, I would highly recommend checking out San Francisco Museum of Modern Art (SFMOMA), the Asian Art Museum, the Legion of Honor Museum and a drive along Highway 1 for its breathtaking views. 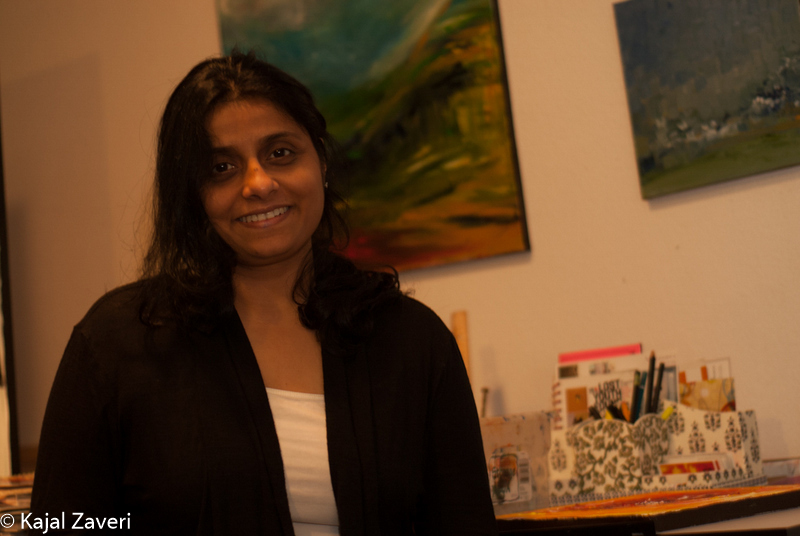 Check out Kajal’s body of work here! Though I am far from an artist, Kajal’s words have allowed me to peep into an artist’s perspective and I love what I see there. Great to hear you enjoyed taking a glimpse into Kajal’s work. Her ‘Sound of the Sea’ painting is indeed stunning!